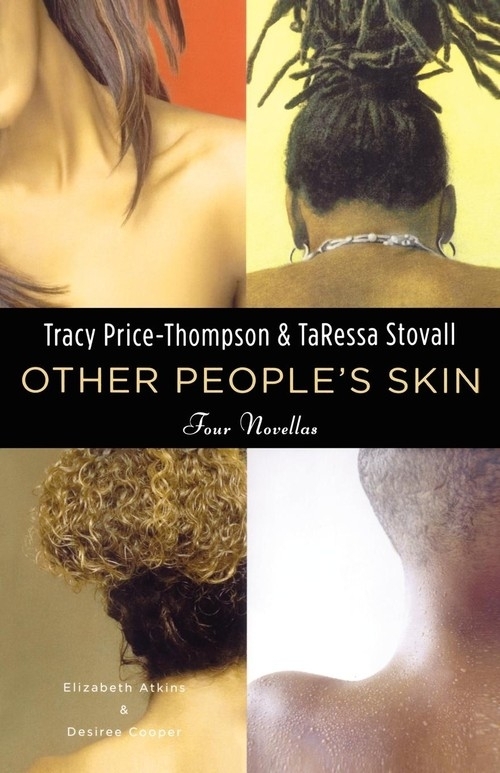 In Other People's Skin, Tracy Price-Thompson and TaRessa Stovall, along with fellow authors Elizabeth Atkins and Desiree Cooper, take on one of the most controversial topics within the African-American community: the self-hatred caused by intra-racial prejudice and the ongoing obsession with skin tone and hair texture. In other words, the skin/hair thang among black women. It begins with TaRessa Stovall's "My People, My People," in which a successful advertising executive acquires firsthand knowledge of prejudice when her clients insist on using light- rather than dark-skinned models. Next comes Tracy Price-Thompson's award-winning story "Other People's Skin," a tale set in 1970s Louisiana, where a dark-skinned young woman must come to terms with the bigotry of her light-skinned family. "New Birth," by Desiree Cooper reveals the intense roles that money, class, and skin color play in the intra-racial relationship between Catherine, a wealthy, light-skinned lawyer, and Lettie, her dark-skinned house cleaner. Finally, Elizabeth Atkin's "Take It Off" tells the story of a biracial girl who hides her coarse, braided hair from her friends at a mixed-race university in Detroit. Other People's Skin is the most innovative and varied anthology of sisterhood and unity to date. Each novella entertains, challenges, and, most important, offers healing to the reader -- no matter what her race, skin tone, or state of mind.